Today's post idea comes from my father. Yes, this blog is a family show. A text from dad this weekend said: "blog idea, belts, the title let's get waisted, ha!" So. Here we go. 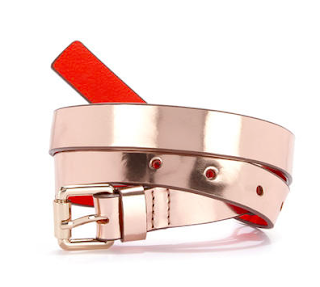 Some fantastic skinny belts under $50 that will define any maxi dress, shift dress, or cardigan coming into the fall. 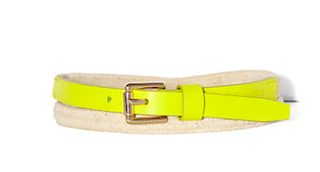 I love the contrasting colors with this belt. 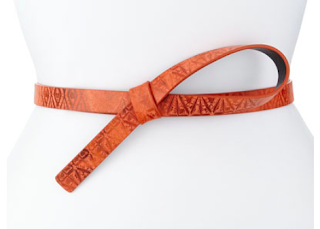 If you cinch it and then tie the excess you will get that pop of orange. I love this belt with a blousy floral dress. It also comes in tan. Who doesn't love a pop of neon? I'd paid this with navy to really wake up an outfit. Something different from you average belt and it's designer! A simple belt can really make all the difference with an outfit. It defines a waistline and it adds a little something extra to your look!